The ShadowMusic Web Community • View topic - Roberto Pistolesi, has it really been 9 years ? Re: Roberto Pistolisi, has it really been 9 years ? Without wishing to pressure you to betray any confidences, did you ever hear from Roberto what Hank's response was to his theories? I helped introduce Roberto to Hank with the help of Warren. Roberto pushed a little too hard and Hank duly ended the meeting. Incidentally I have been playing some early Shads stuff on my Gretsch 6122 and I get closer to the timbre and sound with that on certain tunes than I can with the Strat. Numbers like 'Back Home' ,' Blue Star' and 'Cosy' seem to sound bloody damn close to my ears. I'll never be convinced that Hank didn't use the Gretcsh for the odd recording, as Malcolm Addey said the Gretsch was often present and the red guitars were only seen less frequently. I don't think we'll ever know because I don't think it fits with the story. Tin hat in place. IIRC, Hank and Bruce were asked by an interviewer about this (around the time of the Final Tour if my memory is correct?) and they both denied it was a Gretsch. I presume Hank's reaction to Roberto was always likely...after all, Hank and Bruce had always insisted that Hank used the Strat- wasn't it Bruce who insisted when questioned..'I was there! '), and someone arguing that it was a Gretsch (however passionately and sincerely and well researched) could have been construed as calling Hank a liar...so Hank's reaction was probably predictable.. The only other issue I am curious about is regarding the conditions of the Jennings endorsement when they were supplied with and used Fender guitars and Vox amps...were the Shadows contractually obligated to use the JMI supplied gear in public (TV, adverts, live shows etc) thereby requiring the use of endorsed gear...and if so, did that mean that they were not legally obliged to use the JMI gear when recording? I remember having the opportunity to ask Bruce : "did Hank had enough money to buy the Gretsch at the time of Apache recording ? ", the answer was "no". So if he used one, it wasn't his own. 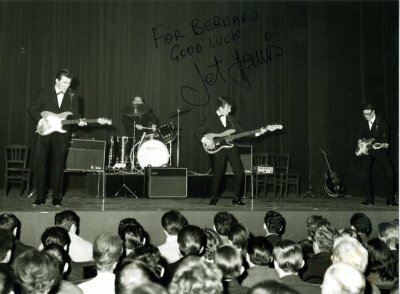 There are some photos from the Paris Olympia in 1962 where the Gretsch can be seen standing as a spare. It wasn't there when I saw the Shadows at the same venue in 1961. Didier wrote: I remember having the opportunity to ask Bruce : "did Hank had enough money to buy the Gretsch at the time of Apache recording ? ", the answer was "no". So if he used one, it wasn't his own. Other information is that Bruce bought his own "Summer Holiday" Gretsch 6120 after Hank bought the 6122, yet Bruce was seen playing his Gretsch on one of the ATV Cliff Richard TV programmes broadcast on 31st December 1960, meaning that Hank had his 6122 in 1960, though there is no clear indication of the date that year when it was bought. Well, Hank definitely had the Gretsch Country Gent when they recorded the first LP by 1961 when he used it on Nivram..didn't he also use it on Cliff's With a Girl Like You also? When was that recorded? A Girl Like You, Nivram and the four tracks from the "Dream" EP (stated by Jet to feature the Gretsch) were all recorded in 1961, with the first of them, A Girl Like You, recorded 28th January. But that doesn't take us any further back than an unspecified date in 1960, since Hank's Gretsch was bought first, and Bruce's Gretsch, bought afterwards, was seen in use in December 1960. It is an interesting and seemingly an on-going debate, though I hasten to add that I'm not in the 'Gretsch was used for Apache' camp. I'm interested in sounds and the technology used then compared to what we have now and my colleague in the band and I have concluded that the sounds on those early recordings is outstanding. We were doing some Everly Brothers stuff and were listening to the records closely to learn as much as we could, in order to try and reproduce the great backing sound we hear on those records, recorded in RCA Studio B in Nashville. The massive sound of those acoustic Gibsons, just like the sound that Bruce achieved on Apache with Cliff's J200. We concluded that they had the sound as good as it gets back then and it's taken sixty years for todays engineers to lose it. 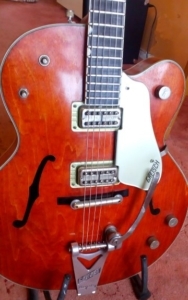 My Gretsch 6122 is the double cutaway George Harrison style, though I did own a '59 single cut the same as Hank's. The sound is the same, so I decided to have a session of Shads playing, using the Gretsch, Gibson SG, Les Paul along side my '63 Strat. On most tracks you could hear the resemblance of the original recordings with the Strat, but one or two worked better on the Gretsch and it gave me food for more thought. The main thing is I'm having fun doing it, as well as healthy debate with all my band members, of whom our bassist is Alan Jones, who can hear what I'm hearing. It's just harmless fun really, but none the less making us think. 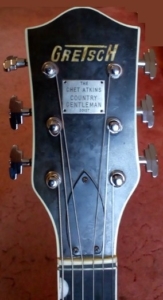 cockroach wrote: Well, Hank definitely had the Gretsch Country Gent when they recorded the first LP by 1961 when he used it on Nivram..didn't he also use it on Cliff's With a Girl Like You also? When was that recorded? I've been reading the comments in this thread with much interest. Hank did confirm he used a Gretsch around 1961 on the records Nivram and A Girl Like You and pretty much confirmed it was the same guitar now owned by Doug. There's also a link at the bottom of the following page to a transcript of a radio interview and phone in between Hank and Doug regarding this Gretsch (the Gloria Hunniford Radio Show in the UK). I know Roberto Pistolisi did try and contact Doug quite a few years ago regarding this guitar, it would be great if there was a way of getting Hank to confirm this was definitely the one used on the recordings. I thought I'd also upload this photo with what looks like a Gretsch in the background. My thanks to Bengt for sharing the photo. Last edited by alturnertive_music on Sun Aug 05, 2018 12:50 am, edited 1 time in total. Pointing out that he could be engineerIng several sessions a day of all kinds, Malcolm Addey has (wisely) said that he cannot remember what instruments were used on what Shadows recordings. I think it’s clear that there was no conspiracy to pass off a Gretsch as a Strat, and that the Gretsch was used on only a few occasions. Precisely how many would be hard to remember 50+ years later, especially if it was not a big deal at the time. To trivialise this totally, I’ve been in recording studios myself from time to time and there is only one session where I know for certain which of my basses I used; that is only because there was a specific reason on that occasion!